Poigai Āḻvār was the forerunner of the Āḻvār tradition, who hailed from Kānchīpuram. 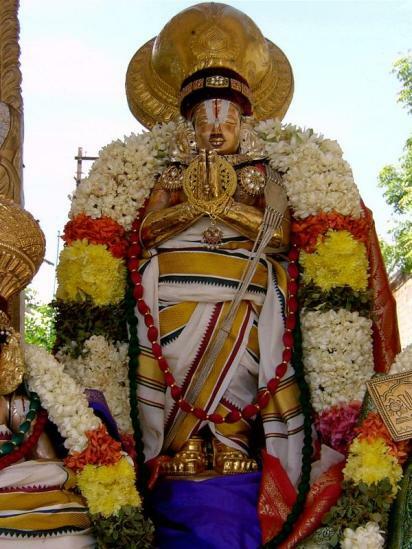 Poigai Āḻvār, along with Bhutat Āḻvār who was born in Mahābalipuram, and Pei Āḻvār born in Mylapore in Chennai, are referred to as Mudhal Āḻvārs, and were born on successive days in the same month and year. According to historical belief, the first three Āḻvārs came together for the first time on a stormy night, seeking shelter in an anteroom of a house in Thirukkovalur, near the shrine of Trivikrama, in Tamil Nadu. The anteroom was a small place, as it usually is, in South Indian houses of olden times, as it mostly serves as a passage or corridor, with a raised platform on one side which serves as a couch. So this anteroom was just about spacious enough for one person to lie down. Poigai Pirāṉ who was the first to seek shelter in the house, was lying down on the platform, when Bhutat Āḻvār arrived and knocked on the door to ask if he could find shelter from the storm. Poigai Pirāṉ let him in with the response that the room was big enough for the two of them to sit together. While they both were seated thus in the room, immersed in sharing their mutual experiences about their peregrinations to various divya kshetras, Pei Āḻvār, knocked on the door, and asked if he too could find some shelter from the rain and wind. The two Āḻvārs opened the door to invite him to join them, saying that the room which was big enough for one person to lie down, and two persons to sit comfortably, was still sufficient for all the three of them to stand. The three Āḻvārs thus came to be standing in the confined space sharing their thoughts and experiences about their visits to various divya deśa’s. Suddenly, they felt a strange pressure in the total darkness as if there was a fourth person in their midst. The fourth person was none other than Lord Trivikrama from the local shrine, Śrī Nārāyaṇa Himself in the company of His Consort, the Divine Mother Śrī Lakṣmī, Who had materialised in that damp, dark passage eager to share their presence and bliss. => Read Irandam Thiruvandhadhi of Bhutat Āḻvār. of the Divine Mother with my ocean-like Lord. Poigai Āḻvār’s ‘Mudhal Thiruvandhadhi is poetry surcharged with great spiritual fervour, affirming the supreme greatness of Śrīman Nārāyaṇa, and the body-soul relationship of the entire phenomenal world to the Parama Purusha, and dispelling the ignorance stemming from the mental veil of Māyā. He has sung in ecstasy about many of the Avatars of Vishnu like Śrī Varaha, Vāmana, Rāma, Krishna etc. and also about God’s presence in iconic form in shrines like Tiruvēṅkaṭam, Śrī Raṅgam, etc. The enchanting natural beauty of the Veṅkaṭa hills and the incomparable greatness of the Lord of Tiruvēṅkaṭam find especial and frequent allusion in Poigai Āḻvār’s verses. Tiruvēṅkaṭam is the favourite resting place of the Lord, in the description of the Āḻvār, which the Nitya Suris of Śrī Vaikuṇṭha cherish as their own, and where everyone from the Vedic wise men to devout young women with sparkling eyes hasten in the predawn hours, when scattered stars are still visible on the firmament, carrying incense, flowers, and holy water. The awesome beauty of the ecology of the hills, the habitat of the dignified Kaurāva tribe, elephants and pythons is recapitulated in vivid detail by the Poigai Āḻvār. He that rests on the waves of the milk ocean, and is present on the Veṅkaṭa hill is also there in the inner space of our being. In affirming this profound truth that God is forever in our hearts as Antaryāmī, the Poigai Āḻvār establishes the essence of Śrī Vaishnava Siddhāṅta to the effect that the Path is Śrīman Narayan, and service at His Feet is the fruit.